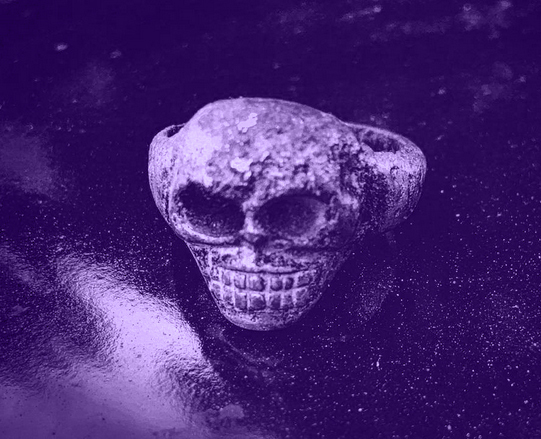 Jared Unzipped: The Skull Ring. There it was, shimmering with the ethereal glow of an abandoned moonbeam. It caught my eye as I attempted to rake leaves in my backyard. Having just recently purchased my home, I was still becoming familiar with the intricacies of the property. As my rake grazed over the pale object, I was immediately curious as to what it was. Setting the rake aside, I bent over and stared at the ivory treasure peaking forth from the soil. I began to claw and dig at the item using my bare hands. Thankfully, the ground was soft from a recent rain and the mysterious discovery was soon turned loose by the dirt. Gripping the clod in my hand, I washed it off under the water spigot. This wasn't just any ring, though. No diamonds or precious stones were set upon it. The front of the ring was emblazoned with an altogether peculiar skull. It flowed continuously with the band, as if the whole ring was formed from one solid material. Rubbing the front of the skull with my finger, I took note of how tactile the carving was. It was so detailed and distinct. Stepping into the glimmering blasts of the sun's setting haze, I marveled at how the ring seemed to instinctively glow. If I didn't know any better, I'd say the light was... pulsating. After a few minutes of cleaning, the ring was finally unblemished and free from dirt. Holding it in my palm for a moment, I wondered if it would fit. Such a prize to be had from my own backyard... how lucky! Bringing the ring to my right hand, I slid it down my index finger. The sun finished it's journey across the sky and came to rest behind the western gate of forever. Dusk took grasp of the world without so much as a whisper. I raised my right hand to the sky, taking note of the stars peaking through the blanket in the darkness. Engrossed by the skull on my finger, it seemed to come alive with the shimmering stars behind it. Hypnotized by the opalescent ring, the entire world seemed to fall away. No sooner had I fallen into the abyss of eternity, staring at the ring... did reality rip me back. A pair of hands took hold of my ankles. Coming to my senses, I looked down to glimpse a rotten face gaping at me. The flesh, peeling from this creature's face, seemed to bubble and twist from the bone. A pair of hollow eye sockets revealed a churning swirl of worms and maggots. Erupting from the soil beneath my feat, the corpse groped and clawed at my legs. Almost immediately, a chasm spread under my feet, knocking me off balance. Crashing backwards into the wriggling grime and dust, another putrid carcass lurched over my torso. Through it's gaping chest cavity, I could see the last flicker of starlight between the decomposing rib cage. Tugging at me, my attempts to fight back were useless. I'm certain I could feel more hands ripping into my skin, pulling me towards an eternal eclipse. I awoke in a black fog. There I sat on a throne of branches and roots, caged in a tomb of earth. If not for the glowing ring, I wouldn't have been able to see anything. I could feel multiple pairs of skeletal hands gripping my feet and hands, but my captors' festering countenance was not visible. My clothes had all but been ripped from my body. Trapped in a dome of under-worldly terror, the decomposing soil writhed and engulfed my bare skin. Things were alive in the dirt, lurching and squirming over me. As a star made of flesh, I was spread apart in every direction and lay bare. Abruptly, a blistered hand pushed through the soil to slide against my inner thigh. Using my leg as leverage, another decomposing arm burst forth. Dripping sludge plopped off the arm and landed on my stomach. Rising from between my legs was a face, not so different from the others I'd seen. Though, in the place of orbital sockets filled with maggots and worms sat two piercing eyes. With no eyelids to blink with, the slime-encrusted eyes just stared at me. Its mouth, absent lips to hide the yellow and black teeth, chattered and chomped disgustingly. Locking eyes with me, the aberration spoke. Words pushed through the gargled ooze in the creature's throat. "Solve my riddle, your life is spared. Fail... and we shall feast." The power to speak had all but left my battered body, but I somehow muttered an affirmation to my demonic host. "I am not real, but to you I am near. Never to be seen, but expected to appear." My mind flew into a glut of directions. Near? Seen? What was the answer? I must know! Simply must! The hands around my limbs squeezed and wrenched. They were hungry hands, for sure. A scramble of thoughts clouded my head, but suddenly, I knew the answer. "Tomorrow! The answer is tomorrow!" The phantasmal inquisitor gnashed its tongue against moldy teeth, obviously upset with the answer. Without warning, a claw most dreadful launched into my stomach. Ripping my skin apart like a jagged saw blade, I could feel it squish my intestines and yank them free from my abdomen. The strength that I'd found just a moment ago vanished. Those eyes... that face... it came to me again. Gushing from the black dirt, the head seemed to gape open and float. I could taste the fetid breath as it spoke again. "Human flesh tastes so much better... when it's seasoned with hope." Dozens of haggard hands pushed through the tangled earth to play in my entrails. I could feel my organs being passed about; my life force being slurped and slathered across their chomping maws. As a cord tied between two opposing forces, my body viciously snapped in half. One set of demons pulled my legs off my frame, taking the hips with them. I could see my viscera trailing downwards, forever to be consumed by the monsters within the depths. The creatures continued to slash and chew at my insides, while simultaneously pulling my arms farther... farther... farther... clop! The bones in my shoulders caught fire as the arms popped out of socket. My body was but a buffet for these fiends. As the last ounce of light from the ring left my eyes, I passed into nothingness. When those that creep through the darkness grow hungry once more.